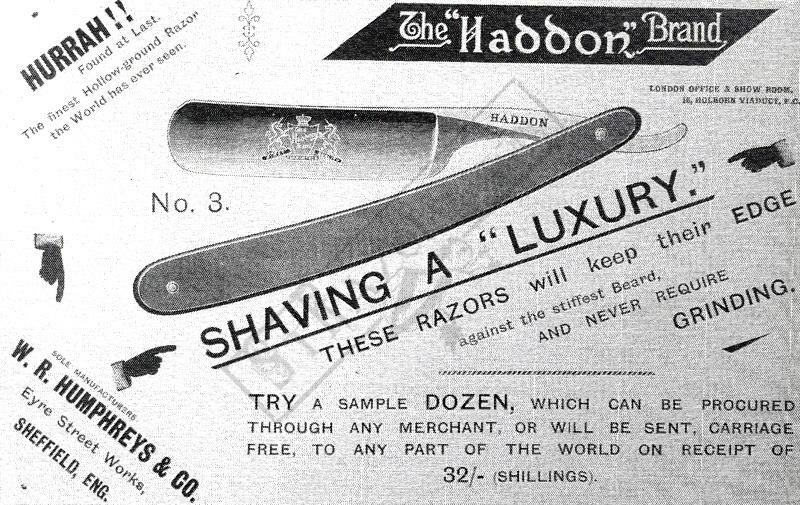 STRAZORS.com - all about classic razors - The Haddon Brand, W.R. Humphreys, Sheffield. The Haddon Brand, W.R. Humphreys, Sheffield. Born in County Cavan, Northern Ireland, in about 1856, William Robert Humphreys was apprenticed in the ironmongery trade before becoming a traveler for a cutlery firm. 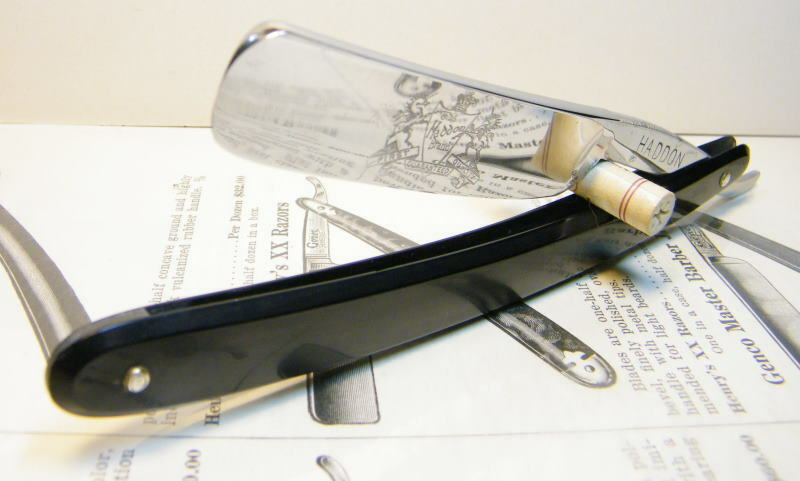 By 1879 he had launched his own cutlery business in Eyre Street, employing about 30 men. In 1894, he was fined 40s(₤2) in a Sheffield police court for imitation the marks of Geoge Butler & Co. He registered his own silver mark from the Eyre Street address in 1895 and 1899. In about 1904, Humphreys renamed it Haddon Works. Trade catalogs show that the firm manufactured (or marketed) a wide range of knives, including most types of table knives and pocket knives. A silver mark was registered in 1905, when the firm also became a limited company. Humphreys died at Derby House, Broad Walk, Buxton on 11 September 1911, aged 65. He left a widow, but no children. However, T.R.H. Graham (c.1873-22 January 1932), Humphrey's nephew, joined the firm as a young man and became managing director until a year before his death. Charles Hinchliffe was also associated with the firm for many years after the founder's death. 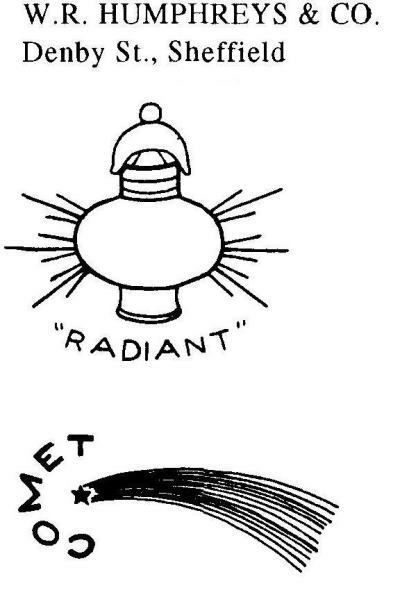 The firm's trademark was a lamp with the word "Radiant". One of the last chairmen at the company was Frank W.Blaydes, who died on 12 March 1954, aged 92. 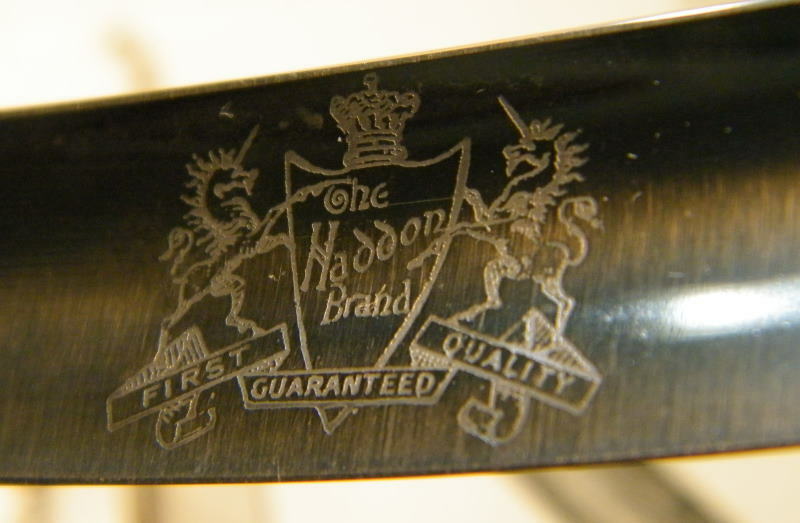 Humphreys produced cutlery at Haddon Works until the 1960s, when it moved to Portland Works, Randall Street. It was last listed in Matilda Street in 1970. According to Tweedale's Directory of Sheffield Cutlery Manufacturers.